Surrounded by immense swaths of stark desert, three “island” environments rise into the sky above the searing lands of the southern continental U.S., each offering refuge to unique species of plants and animals. Far-sighted efforts have preserved these “islands” as national parks to protect the unique ecosystems evolved in isolation over eons. Each is prized for the diversity of life found in an otherwise inhospitable environment. Though isolated, good roads will get you to these locales. Depending on the time of year, you may feel like you’re on a deserted island. But if it’s solitude, stillness, and starry nights you crave, the desert delivers in a spacious way. 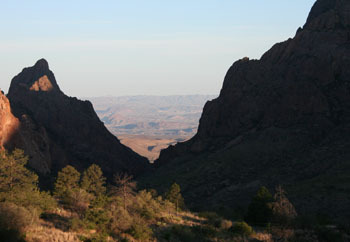 Big Bend National Park rises dramatically a mile above the canyon carved through the Chihuahuan desert by the Rio Grande River in southwest Texas. The river—which you can raft down—forms a rugged boundary with Mexico. In Big Bend, prehistoric artifacts date back 10,500 years and the wide trail traversed yearly by the Comanche into Mexico remains a visible record etched into the desert. Visitors are few and far between, except at birding time when this becomes an airy resort for birds plying the central flyway. Northern birds use the park as their southern boundary, while southern birds will venture this far north to rendezvous. Birders scramble around the alpine peaks in hopes of adding the Colima Warbler—found only in the Chisos Range—to their lifetime list of sightings. There are no services after you leave Ft. Stockton until you reach a few tiny communities around the park. Once, a warning light on my dashboard caused me great alarm. What relief to find a knowledgeable mechanic in little Terlinqua. 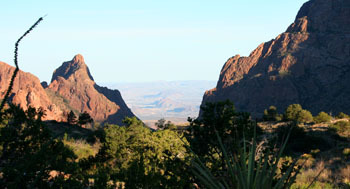 Big Bend Park was established in 1944; 360,000 visitors trekked in the park in 2007. Great Basin National Park in east-central Nevada juts above the desert floor on the second-highest peak of the state, near the Utah border. The great basin country is actually a giant sinkhole—no rivers drain out of it. Rumpled by range after desolate mountain range, Nevada is the most mountainous state in the United States. In this desert park, you’ll find a surprise: a glacier at the summit of Wheeler Peak. Summer is a refreshing time to visit this alpine setting—despite the sizzling drive. Before uttering a complaint, though, consider the plight of those sweaty young riders of the Pony Express galloping through at 10 miles per hour. The road to the park follows their forlorn 1860 route between St. Joseph, Missouri and Sacramento. Indeed, this section of Hwy. 50 is dubbed the loneliest road in America. Great Basin Park is well worth the effort to reach, however. You’ll find the best air quality, the oldest trees, and the most stark contrasts of any desert park. Besides the mountaintop experience, and fishing in streams, visitors can also walk into the bowels of the earth through the Lehman Caverns. Start with a full tank of gas before venturing out on the long drive between services. This park was established in 1986, but just 81,000 visitors dropped by in 2007, making it perhaps the loneliest of U.S. national parks. Joshua Tree National Park was lifted up above the Sonoran desert through vulcanism and plate tectonics. The San Andreas Fault, starting in the San Francisco Bay area and running through this area of Southeastern California, marks the edges of two major plates bumping up against each other. The park is located at the intersection of three desert ecosystems: the lower Sonoran desert, the higher Mojave desert, and the eastern flank of the dry Little San Bernardino mountain range. At first glance, the landscape looks utterly barren. But the oases support flora and fauna adapted to life without water—the most curious being the Dr. Seuss-like Joshua trees. With a sizeable portion of the park designated as wilderness, human development never spoils the immense vistas. Over two hundred varieties of birds flutter in and out of the area, which is a rest stop along the Pacific flyway. Besides being a mecca for bird watchers, the rocketing popularity of rock climbing and bouldering draws enthusiasts during the winter months. Established in 1936 as a monument to preserve the desert plants being filched by Los Angeles homeowners to landscape their yards, Joshua Tree attained national park status in 1994. With the nearby Palm Springs area exploding with growth, over 1,300,000 admirers visited this fragile environment in 2007.